At CES 2019 Thermaltake officially entered the memory market with two new kits of DDR4 3200 RAM which not only include integrated water blocks but also includes 16.8 million color RGB customization. The new Thermaltake WaterRam looks to push the boundary of memory cooling products which is compatible with its RGB PLUS Ecosystem for uniformity with other compatible components. The Thermaltake WaterRAM RGB DDR4-3200 memory features an XMP 2.0 one-click overclocking profile for easy application within the BIOS. The heatsinks themselves are constructed with 2 mm thick aluminium for good heat dissipation and Thermaltake advertise the WaterRAM heatsinks to reduce temperature by up to 37 % over conventional heatsinks. The Thermaltake WaterRam uses dual G 1/4 connectors for compatibility with most water cooling fittings for easy installation. Across the top of the heatsinks is an addressable RGB LED bar with support for up to 16.8 million different colors. The RGB can be synced up with other Tt RGB PLUS Ecosystem compatible devices such as Razer Chroma, Amazon Alexa and even component-based technologies such as ASRock Polychrome, ASUS AURA Sync and GIGABYTE RGB Fusion. Each kit of WaterRAM runs at DDR4-3200 C16 18-18-38 2×8 GB and has an operating voltage of 1.35 V. Thermaltake has informed us that the memory IC of choice comes from Hynix. 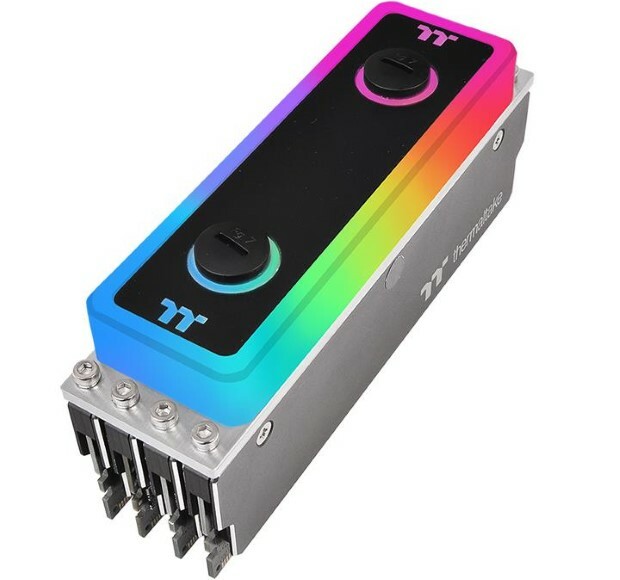 Thermaltake has provided the WaterRam RGB Liquid Cooled memory with a limited lifetime warranty, but the water block element only features a 2-year warranty. In terms of pricing, the 2×8 GB kit costs $250 while the 4×8 GB kit has an MSRP of $440. Availability is unknown, but Thermaltake state that the WaterRam is currently being pushed into retail channels imminently.